Editor’s Note: I apologize for the lack of card tags in this article. At the moment of this printing, I have to do all the card tags myself, and I figured that it was more worth while to have the article up then keeping you waiting even longer. I apologize for the inconvenience, and recommend having magiccards.info up on a tab or new window to look up the cards you don’t know. I am currently trying to find something that works. Thank you for understanding. 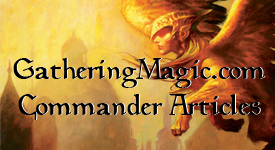 Welcome to the inaugural 99EDH deck clinic where we help you with your EDH deck problems. This took a little longer then I thought, but finally we’re here. Not really this much else to say, is there? Let’s get right to it. Billy chimes in with his problem (and suddenly I feel like Casey Kasem). My name is Billy, and my general is Rafiq of the Many. I want to have my deck be the subject of a deck clinic because I’ve found that my EDH games are very non-interactive, linear, and predictable. My EDH games go from 1v1 to 6 or more people, so I try to be versatile in the face of a metagame that involved token (Rhys), general damage (Uril), prison (Hokori, Numot) and combo (Sharuum, Blue Braids, Niv-Mizzet) strategies. My favorite type of EDH game involves lots of bickering and vying for control of the field, and I found that my games are usually a Reveillark combo or a Strip Mine lock, and is overly dependent on a few spells like Intuition. It seems like my deck has 20 or more cards devoted to combo and 20 to tutoring them. My deck is so linear that I frequently play Pithing Needle naming Relic of Progenitus before one is even in play because my deck doesn’t do anything without graveyard recursion. I have trouble making room for dramatic, fun, social effects like Twincast, Bribery, and Pheldagriff, and even basic utility cards like Path to Exile. I also find myself scrambling for my 1 answer to a specific threat. Card availability is not an issue but has one caveat: I am hesitant to spend money on cards that aren’t a rock solid investment like Force of Will. In short, I’ve got 99 problems and a too linear deck is one. Yes, the final line sold me. What I love about EDH is the fact that you don’t have to play a linear deck if you don’t want to. Sure, there’s going to be cards that you would prefer to see every game, or close to every game, but with 99 different cards, it allows you to do different things. Having a deck that’s just trying to be the same thing over and over will get the people in your playgroup hip to the type of game your doing. I suggest going several different routes of winning if it’s not just smashing face. I use Hinder/Condemn and Tunnel Vision to deck someone. I one-shot somebody with Rafiq and Might of Oaks/Finest Hour. I lock someone out with Strip Mine and Life from the Loam, sometimes with Azusa, Lost but Seeking. I lock someone out with Counterbalance and Sensei’s Divining Top. I mill my entire deck with Hermit Druid/Tunnel Vision, and cast Reveillark/Open the Vaults to get my combo pieces into play. I use some combination of Reveillark, Eternal Witness, Body Double, Mirror Entity, and Karmic Guide to either lock with Acidic Slime or deal infinite damage with Aeolipile/Triskelion. I intend to add Brain Geyser/Stroke of Genius so that I can use Saproling Cluster, Ashnod’s Altar, and Fecundity to generate infinite mana and deck an opponent. It’s good to have different paths to victory in an EDH deck if they don’t revolve around your General (where you currently have one, the always good Rafiq and Might of Oaks finisher (3/3, exalted, double strike, and +7/+7 = 22 Damage (4/4 + 7/+7 = 11 x double strike = 22)). Here’s the issue with what you have currently: You’re playing either “infinite combos” or really annoying locks, and it’s a race to see which one you can get to first. Now, if it was a combo deck you wanted, I’d say that’s alright, and get some more combos in there. But, you said you like to play games where you control the board. You’re in great colors for board control: Blue, Green and White all have good cards to do so. Looking at your list, you really don’t have a deck for that. Most of your combos do make use of the graveyard and if they have any graveyard removal (which any good EDH player should) you’re screwed. Plus, like I said, most of these are great combos 1v1, and you want something that can battle against other Generals as well. Let’s change some things up with your deck. Here is a link to a Google Spreadsheet of the deck with the proposed changes. It’s separated by card type and by Old Deck/New Deck. Cards that are Red in the Old Deck category are ones I’m removing while Blue cards in the New Deck are ones that I’m adding. And, if you go further down, you can see other cards that didn’t make the cut but were considered. I only added two cards above a couple of bucks (minus one part), and both of those are used in older formats so they’re a good investment. I’d like to make note here: this is just some helpful advice. While I was given what kind of decks they usually play against, there may be some cards that I tossed out that you might say are essential to beating those decks. Anyone trying to build a deck like this might not like any of my advice and build the original deck. That’s fine, I don’t care. But here is my opinion, it was asked. What follows here are just the changes I made to the deck. Cards like Eternal Witness and Finest Hour and Cryptic Command were in the deck and remained in the deck. The link is above to see the full list, but here are the changes, which is what people care about. OUT – We take out some lands that don’t always work in these decks. Yes, the cycling lands are great, especially with Life from the Loam which you have, but you only really need one of them. Cephalid Coliseum might be good if you’re trying to deck someone and bring it back with Life from the Loam and could get thrown back in there. Riftstone Portal is cute, but not enough discard in the new deck to make it effective. Sunpetal Grove is worthless in a deck with only two lands that make it come into play untapped (and would be better played as one of the new Worldwake man-lands). As for Magosi, the Waterveil, I haven’t had too much success with it yet, so it’s gone as of right now. IN – This is mostly bookkeeping. I’ve found that with my Rafiq deck, I’ve relied on those hybrid lands so I’ve completed out the set. The Dual lands can be anyone you want, either the original ones (If you’ve got the money or have them), or the Ravinca ones (which are pretty cheap); it’s all to personal preference. Vitu-Ghazi, the City-Tree works well with a combo that didn’t make it in here, but does with a couple of combos that did. ALMOST – Fetchlands are always good, maybe if you take out the Vivid lands; the fetchlands are better if you have more lands with basic land types (like Duals). Treetop Village is always a good attacker and is less prone to removal, but was just short of making this list. OUT – Aeolipile was part of a combo, but also the grandfather to Pyrite Spellbomb (but can fit in any EDH deck). While it’s sad to see Whispersilk Cloak to get pushed off the stage as it’s great with Rafiq, but sadly cannot combo with Might of Oaks (but does with Finest Hour). IN – And this is where we start to see the deck more over to more of a controlling aspect, which is funny, because more of these artifacts help with combos as well. Crystal Shard can help tap opponent’s mana or bounce a creature, but let you bounce your own, like say, Eternal Witness? Engineered Explosives help with token populations and other various problems. Mind’s Eye is just good in multiplayer. Proteus Staff is a fun artifact that some people forget. While it doesn’t completely Polymorph a creature, it does put them on the bottom of the owner’s library which is good if you’re using Tunnel Vision (the main combo this deck is keeping). Or, if you have a token generator (Vitu-Ghazi), lets you get your own creatures instead. Reito Lantern is there to help with Tunnel Vision and with graveyard removal. ALMOST – Again, Whispersilk Cloak is right on the edge, as well as Lightning Greeves. Sol Ring isn’t in here (a lot of colored mana costs), and Blasting Station for a combo that got cut. OUT – You did have Counterbalace/Top combo, but tossed that due to it being an “un-fun” combo and makes you a huge target. Faith’s Fetters and Prison Term both help shut down attacking creatures and can shut down their abilities and are always a second glace. As for Saproling Cluster? This isn’t really a Group Hug deck and I think could hurt you more times than help you even though the Genesis/Riftstone Portal interaction is cute. IN – If you take a look at the list enchantments considered, this was going to be a much more enchantment based deck. It was whittled down and instead added two more instead of the 50 I had planned. Each of the concerns you had with a deck type now has a silver bullet enchantment. Arcane Laboratory/Rule of Law shuts down combo decks. Aura of Silence slows down other enchantments/artifacts. Dueling Grounds go against token decks and helps Rafiq with double strike. Island Sanctuary is a nice almost-Moat where you do have to give up your next draw step, but you can’t be attacked accept by flying or Islandwalk creatures (anti-Uril). Ivory Mask and Privileged Position help protect you and your stuff against other combo decks (Niv-Mizzet/Sharuum). ALMOST – Every other available enchantment. Seriously, Glare of Subdual works amazing with Vitu-Ghazi and Aura Shards. Fool’s Demise was part 2 of an amazing combo, and Mind Over Matter would replace Saproling Cluster. OUT – And gone are most of the graveyard interaction cards. Azusa with Strip Mine and Life From the Loam is again, not fun for anyone (plus you have no landfall to abuse). Not enough creatures to recur with Genesis (but that could be the point too, almost made it back in). The rest of the cards were used for combos so they were left off, though Karmic Guide was on the list as, well since it’s so good. IN – When you want to play a creature, it has to do something in EDH, either an “enters the battlefield” trigger or some game changing effect that people will look at you and take you seriously. While you want the controlling aspect of the game, this deck lacks a true EDH “Finisher”. No Akroma, no Darksteel Colossus, nor Inkwell Leviathan. Why is that? While Terastodon can sort of be considered a finisher (however without evasion), but that’s not the point. I left them out because out of all the different ways that you can win by creatures, Rafiq on its own is still pretty good (which would be different than if you wanted to win by smashing with fatties with double strike). Each of the new creatures brings in something that helps you take control of the board (sans Noble Hierarch who’s just good). Academy helps go get enchantments and acts as a wall who don’t want you to do something nasty. Aven Mindscensor nullifies tutors really, really well. Grand Arbiter slows down the game for your opponents (taking combo down a notch) while proving some acceleration for you. Seedborn Muse gets around Hokori decks (and is the creature most easily replaced in my opinion). Solemn Simulacrum help gets your third color of mana early in the game and replaces itself if it goes to the graveyard. Terastodon, combos amazingly with one of the Sorceries, and can be Body Doubled if it’s in your graveyard (enter the battlefield triggers still happen). ALMOST – You can slide in a finisher if you feel like you need it (and you may, it all depends on your playgroup). The card I want to talk about is the third of the mysterious combo: Academy Researchers. Play Academy Researchers, enchanting it with Fool’s Demise. Blasting Station, sacrificing the Researchers. Fool’s Demise goes to your hand, Researchers back onto the battlefield, Station untaps, you can then enchant Fool’s Demise onto the Researchers again for an “infinite” damage combo, killing everyone at the table. Seems a little more playable for multiple players than emptying your library into your graveyard and hope everything still happens ok.
OUT – Austere Command I assume was used for token creatures and a more flexable version of Akroma’s Vengeance. Three tutors (Fabricate, Idyllic Tutor and Merchant Scroll) were too expensive to other options or too little reaching. Open the Vaults was part of a combo which is now gone. Restock got replaced for something more abusable. Tooth and Nail would’ve been better if we had more finishers in the deck. IN – Let me address that foil card to the right. Yes, this is the other “big” card that I added to the deck. It too is a wise investment especially if you want to play Legacy. With Vitu-Ghazi, it allows you to go get the following creatures in the deck: Acidic Slime, Cold-Eyed Selkie, Eternal Witness, Noble Heirarch, Seedborn Muse, and Terastodon. It’s a great toolbox card that allows some silly things early in the game. Akroma’s Vengence is included instead of Austere as it also cycles. You wanted Bribery, you got it (which allows you to get an opponent’s finisher). Regrowth is cheaper than Restock, though it doesn’t go return two cards. Rite of Replication lets you kill opponent’s Generals or let you copy, I don’t know, Terastodon? Does that seem good? Supply//Demand lets you make tokens, or tutor for multi-colored spells. ALMOST – Reap and Sow lets you go get any land you want, but you already have Wayfarer for that. Hallowed Burial is a great alternative for Wrathing effects (and Wrath of God is in the almost list as well) and gets rid of Uril. Balancing Act, while fun in idea, may get you a target thrown on your head as well. OUT -Actually, all of these Instants are great for EDH, so cutting them for something else is a little hard to do. The main one, Condemn, goes in with the Tunnel Vision combo of this deck. That one, out of all of them, barely missed it. Dream Fracture really doesn’t belong in this deck (again, more of a Group Hug card). Intuition gets left out when we ditch the graveyard idea. Pact of Negation is a metagame call. IN – Brainstorm. While not only good by itself, is really good when you have a creature in hand and Proteus Staff on the battlefield. Enlightened Tutor replaces both Fabricate and Idyllic Tutor for something cheaper that you can play on the first turn. Why does no one play Oblation? Look at it. Who cares if they draw two cards (a little oxymoron since I’ve been screaming about this Group Hug deck thing. The issue is that you can also can also target your stuff and save it, and draw two cards). Twincast is fun; I don’t think I need to say any more. ALMOST – Evacuation is a card that bounced Uril and destroys his enchantments, as well as gets rid of a token army. Path to Exile still didn’t make it, but I didn’t know what else to cut. Teferi’s Response is a very fun card to handle with Numot. More Disenchant type spells? I listed a few. Wordly Tutor works amazing with Proteus Staff. ALMOST – Jace, the Mind Sculptor because of his Brainstorm ability. Elspeth makes tokens as well, but with Garruk’s, you can Natural Order them. So there are the changes to the deck. What you’ve got here are some combos that are still intact such as the Tunnel Vision route of winning. When Rise of the Eldrazi comes out, that new “wall” should go in this deck too, returning Tunnel Vision to your hand. We’ve completely changed this deck from relying heavily on the graveyard to putting more game-altering permanents in play. Yes, there is less game ending combos in the deck, but there are small ones which means something for everyone. Crystal Shards will help abuse your “enter the battlefield” creatures as well as control your opponents. Proteus Staff will make them think twice of playing their General as well as abusing the ability for yourself. The list goes on and on. Now, hopefully, you can take different routes to victory besides on just relying on the graveyard. Not everyone will agree with my changes and that’s perfectly fine. Others will shake their head, ask why I don’t have more infinite combos and shove those in there as well. With this deck, I believe that things are more synergistic than they used to be which will cause the pilot to not have a linear time playing this deck. These cards should now give you a little more interaction with the rest of the players in your group. If any of you readers have any thoughts about what should go into the deck, please voice them below. Billy, I hope you’re happy with some of the changes that I suggest. It was a very interesting and fun experience. Hope you guys liked it as well. Additional link to the spreadsheet. This entry was posted on Wednesday, March 17th, 2010 at 3:12 pm	and tagged with Rafiq of the Many and posted in EDH, EDH Deck Clinic, Magic: the Gathering. You can follow any responses to this entry through the RSS 2.0 feed. « Good News Everyone! I’m on an Internet Podcast (and More Good News)! Oblation is so good against mind control effects! as it is the owner that draws. Proteus Staff and Grand Arbiter are some of the grief-iest cards I can think of. But then again, if your group is rolling Uril out there, all’s fair I suppose. Overall a very spike deck which is again in the face of the ideals of EDH. Actually if your playgroup is all Rafiq, Uril, and Sharuum I’d just up and quit playing EDH. I mean really lets just net deck a casual format? That’s like rolling up to your casual playgroup with full teir 1 legacy deck while the others are playing random jank fun decks. Greifer cards are a part of some EDH playgroups but defeat the point of the format. The focus on all these table clearing combo’s, 2 card kills and etc are just boring. Sure they are foilable, and just playing a creature bash deck is boring, but still. I like the idea of oddball kill combo’s, fun cards like ITB effects and control/recursion/attrition games. You added a lot of good elements to the deck but all the references to the elite generals just makes me think the though process is off. If you want to do degenerate things just play legacy/vintage. /rant off. Regardless its a lot of great improvements to the deck, but its also nearly a completely different deck. My advice is to take the changes you like and ask your playgroup how they feel about your deck. If they think its still not fun to play against (or let them play it and tell you if they find it fun to play) then make a few changes. Use this new list and your old list and find a balance that suits you. no, it’s not. it’s like rolling up with a strong edh general into a playgroup of strong edh generals. how about he plays magic how he wants? his playgroup is full of top tier generals. rafiq is about as strong as uril or sharuum or niv-mizzet. i thought edh was big on social convention and house rules, and it looks to me like he’s not doing anything outside of what his playgroup does. you can play with barktooth warbeard if you like but it looks to me like rafiq is just fine in this context.